When creating content for your website, publishing advertisements on platforms like Google AdWords, or writing a new blog post, it is vital you keep keywords in mind. But just telling you to keep keywords in mind isn't enough, so we're going to go into detail on exactly what kinds of keywords you should target. Long tail keywords are a type of keyword phrase that has at least three, and some times as many as five words in the phrase. Long tail keywords are used when the website wants to refine search terms to the web page, as well as when the searcher is looking for something specific. They can help increase blog traffic. What is the real impact of long tail keywords? This recent infographic from HitTail helps explain how important they really are. These seo solutions can increase blog traffic. Find this information valuable? Check out our 3 SEO Lies You Still Believe. They make up as much as 70% of all search traffic. Pages optimized for long tail keywords move up 11 positions on average (compared to 5 positions for head keywords). Conversion rates are 2.5 times higher than for head keywords. These longer and more specific keyword phrases are more likely to be searched by visitors who are closer to the point-of-purchase. For instance, if you're a small coffee shop in Minnesota, you probably won't be at the top of Google's search results for "coffee shop." However, if you're a small organic coffee shop that only brews fair trade beans, long tail keywords like "small organic coffee shop brewing fair trade beans,” or “where to buy fair trade coffee in Minnesota” will reach the consumers looking for just that, bringing them closer to you. Plus, they're probably ready to buy. You may be thinking, “If my keywords are too specific, no one will ever find my page!” Fear not. In terms of raw numbers you may be attracting less traffic, but if your long tail keywords are implemented strategically, you’ll acquire smarter traffic. By doing this, your return on investment will be much higher and you’ll target the exact visitors you want - not users who will simply bounce from your page. With that being said, including head terms like “coffee shop” in your long tail keywords will still give you a chance at ranking for them. Additionally, Hubspot explains that linking competitive terms to your most popular pages will give you a boost. Type it into Google search - It may sound silly, but this puts you in the exact position of a visitor in the beginning stages of the buyer’s journey. Once you start typing in your business, niche, product or service, Google will start suggesting terms. Make a note of these terms and strongly consider targeting them. Analyze your search query report - If you’re using an SEO platform like AdWords, take a look at your search query report. There’s always a list of search terms that your website popped up for, and many times they are long tail keyword phrases. Expand on the phrases and target the searchers who have already seen you. Search like a local - If your goal is to market to the local consumer, search like it. More often than not, a local will type in what they’re looking for and add their city at the end. SiteProNews explains that these phrases are called “long tail geo targeted keywords,” and they can be overlooked because of their low search volume. However, they can be extremely beneficial to niche geographic markets. Now that you have a list of long tail keyword phrases, stuff as much as you can into all of your posts. Just kidding! As you may already know, you can get penalized by Google for packing keywords into your posts, especially if you aren’t writing in a normal human voice. In fact, keyword stuffing is an SEO no-no. Write in a voice you would like to read in and include a long tail keyword anywhere it makes sense. After intentionally using long tail keywords in a handful of articles, measure to see how much traffic your site is generating. Stick a benchmark in that number and compare it to the numbers you take in next month to measure the effectiveness of your long tail phrases. From these results you can also tell which specific long tail keywords are driving the most leads. Hubspot suggests piggybacking off of already successful long tail phrases and using synonyms of keywords. A great example of long tail keyword usage is Netflix. Have you noticed when you’re searching for a show to binge watch, some peculiar categories pop up? “Coming-of-age animal tales” or “Mistaken-identity movies for ages 5 to 7” are not random categories in regards to the user - they are data-driven, personalized, long tail keywords. Although it may seem like Netflix is formulating obscure titles for their categories, they are using long tail keywords to make the user’s experience as positive as possible. But sometimes they just come out as humorous attempts at trying to get you to watch Return of the Killer Tomatoes. 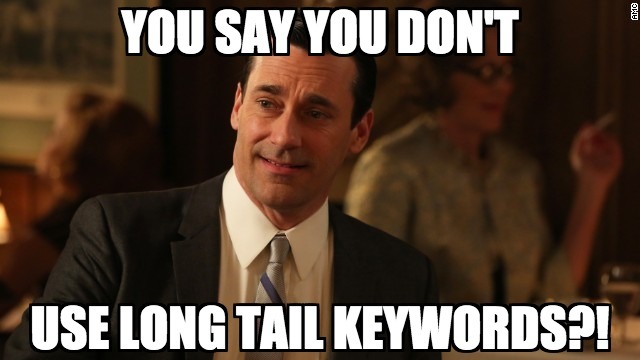 So, what is a long tail keyword? What questions did you have during the process of researching our products and services? What made you trust us? Why did you choose our product or service? What have you learned since using our product or service that you wish you had known before? Answers to these questions will supply you with a variety of ideas for long tail keywords customers might be searching. Creating relevant and informational content with long tail keywords will put you in a position to gain smarter traffic, leading to an overall increase in numbers. PJ Calkins is a Solution Engineer. He is an expert at identifying client needs, marketing strategies and budgets. PJ has managed over 4.5 million dollars in PPC advertising and analyzed almost 1 million unique website visitors across dozens of websites & industries. Because of his lengthy experience running a small business, he also has tons of experience in problem solving and creative brainstorming.